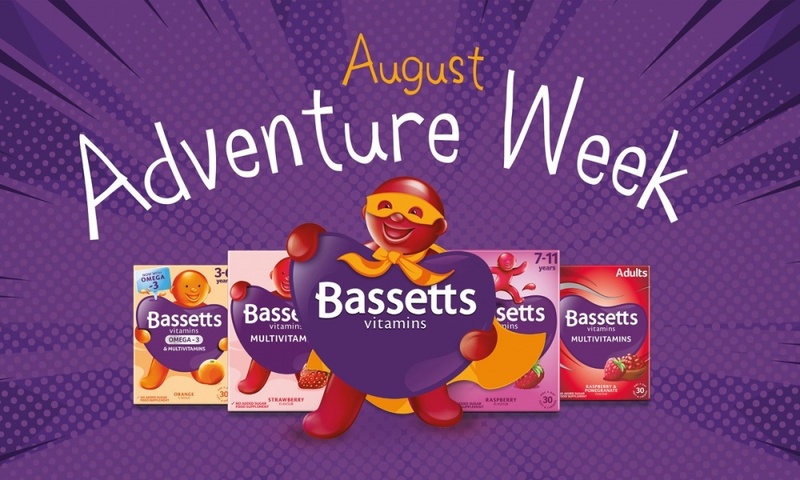 Calling all fun loving families – this is your chance to host a Bassetts Vitamins August Adventure Week party! There’s never a dull moment in family life, especially during the Summer holidays. That’s why we are working with Bassetts Vitamins to offer families like yours the chance to host an August Adventure Week party. Parents love Bassetts Vitamins, because kids do – so get ready, get set and GO enjoy adventures galore! 1,000 lucky families will be selected and receive a party pack full of creative and educational activities AND chances to WIN prizes! 2. Entry to all aspects of this competition is open to all legal residents of the United Kingdom aged 18 (eighteen) years or over at the time of entry who are resident in the UK but excluding employees of Ernest Jackson Limited, 29 High Street, Crediton, Devon EX17 3AP (“Bassetts Vitamins”) and Come Round and their respective families or other persons professionally connected to the promotion (“Entrants”, “you”, and “your”). 3. This competition is open to hosts and guests of “August Adventure Week #MyBassettsVits Parties” (each, a “Party”) selected by Come Round and taking place between 20-26 August 2018. 5. The closing date for entering each competition is 23:59 on Sunday 9 September 2018 (the “Closing Date”). 24. The decision of the judge shall be final and unchallengeable and in their absolute discretion they may declare any entry void. No reasons will be given for any decision made by the Judge. The Judge comprises a panel of employees and/or representatives of Bassetts Vitamins and Come Round. 28. All Entrants (hosts and guests) grant to Come Round, to Bassetts Vitamins and to any brand partners (whose product is included in party packs sent to Party hosts) (“Partners”) a non-exclusive, irrevocable, royalty free license to use, reproduce and exploit for the purposes of advertising this competition, Bassetts Vitamins, Partners products, Bassetts Vitamins #MyBassettsVits Parties across media all materials supplied in their entries, and to sub-license these rights to others. We will not be required to obtain Entrants’ further consent to such use. All Entrants agree that Come Round shall be the owners of the copyright in and to any such materials created at Bassetts Vitamins #MyBassettsVits Parties which comprise your name, likeness, image, words, quotes, photographs, recordings and other personal attributes. Accordingly by entering this competition you agree that Bassetts Vitamins, our partners and we can use all such materials supplied in their competition entries (including, without limitation, photographs and videos) as they and we wish, including, for example, for promotion of Come Round and future Come Round parties and events. 32. Using the A4 sheets in your party pack (the ones with the STABILO logo and Bassetts Vitamins man in the left and right bottom-hand corners respectively), ask children at the party if they would like to draw a picture of what they think Bassetts Vitamins taste like. Tell them to be as creative as possible. 33. This competition is open to any children at the party (not just the children of the Party host). 35. Take a photo of each child’s drawing and upload it to Instagram, Twitter or Facebook using the #MyBassettsVits hashtag. 36. Make sure you upload your photograph to social media before the Closing Date, which is 23:59 on Sunday 9 September 2018. 37. There is no limit to the number of photographs each person can submit for this competition and each counts as 1 (one) entry. 38. All entries must be original and owned by the person submitting the entry (i.e. not, for example, taken from an existing source). 39. On or around Monday 10 September 2018, the Judge will pick their favourite drawing entry (based on quality and creativity) as the winner. 40. 1 (one) winner shall win £150 (one hundred and fifty pounds) worth of STABILO colouring products provided by STABILO International GmbH, Schwanweg 1 – 90562 Heroldsberg, Germany. 41. This prize is awarded to the parent who uploaded the winning drawing in accordance with the above. 42. Whether you are a Party host or a guest we would love to know what you honestly think - good or bad - of Bassetts Vitamins. 43. Choose 1 (one) Bassetts Vitamins product to write your review about. 47. The first 20 (twenty) Party hosts or guests to do (a) and (b) as set out above, will each win 1 (one) Thorpe Park voucher entitling them to free standard entry for 1 (one) day for 1 (one) adult with each paying child before 30 September 2018. 51. The prizes for part of this competition are provided by Thorpe Park Operations Limited, Link House, 25 West Street, Poole, Dorset, BH15 1LD (“Thorpe Park”) and also by Macmillan Publishers International Limited (“Pan Macmillan”), 20 New Wharf Road, London N1 9RR and are subject to any terms and conditions set by Thorpe Park and Pan Macmillan respectively. Travel and accommodation is not included in this prize and must be arranged by the winner. The winner is responsible for ensuring that parental and school permission is obtained in respect of every child. 49. These prizes are awarded to the person who emails the screenshot of their review to BV@comeround.com in accordance with the above. 52. Whether you are a Party host or a guest we would love you to share your favourite parenting hack or top tip on Instagram, Twitter or Facebook using the #MyBassettsVits hashtag. 53. Make sure you post to social media before the Closing Date, which is 23:59 on Sunday 9 September 2018. 54. There is no limit to the number of posts each person can submit for this competition and each counts as 1 (one) entry. 55. All entries must be original and owned by the person submitting the entry (i.e. not, for example, taken from an existing source) and any entries which are offensive, defamatory or use inappropriate language will not be considered. 56. On or around Monday 10 September 2018, the Judge will pick their favourite parenting hack or top tip (based on quality and creativity) as the winner. 57. 1 (one) winner shall win a trip to Thorpe Park for up to 30 (thirty) children and up to 10 (ten) accompanying adults giving them all free entrance on 1 (one) day to Thorpe Park and access to a STEM workshop from Thorpe Park’s Thrills programme, more information on which can be found at https://www.thorpepark.com/tickets-passes/schools-youth-groups/schools/education. Travel and accommodation is not included in this prize and must be arranged by the winner. This prize must be used before 27 September 2019 and cannot be used at weekends, bank holidays and between 1 – 26 July 2019 (inclusive). The winner is advised to check the Thorpe Park website for details of opening and closing season dates (Thorpe Park is usually open from the end of March and closes at the end of October each year). The STEM workshop is subject to availability as Thorpe Park have limited spaces each day - early booking is therefore advised. 58. Travel and accommodation is not included in this prize and must be arranged by the winner. The winner is responsible for ensuring that parental and school permission (if required) is obtained in respect of every child. 59. This prize is provided by Thorpe Park and is subject to any terms and conditions set by Thorpe Park. 60. This prize is awarded to the parent who made the winning post in accordance with the above. You must be at least 18 years old to apply to host this party on behalf of your child. 1,000 applicants will be shortlisted as party hosts based on how well each applicant's' demographic information matches the demographic profile we require for this marketing campaign. Those hosts will be required to have at least 9 child guests attend their party, with the host having invited and obtained permission from the (guest) parents through Come Round’s private invitation system in order to be eligible to receive a free party pack and Bassetts Vitamins product. Each host is required to carry out activities including creating and sharing content on social media using the #MyBassettsVits hashtag. The homeowner’s prior permission where you plan to hold your party must be obtained. No more than one application to host may be submitted by each person and no more than one application to host may be submitted per household. UK mainland households only. Come Round is the marketing agency running this marketing campaign on behalf of Bassetts Vitamins.